Tonight at midnight $465 worth of LEGO Dimensions product goes on sale. How much does one need to pay to have a good time? Let our buyer’s guide be your...guide. LEGO Dimensions, taken as the whole of the first series of starter and toy kits, is the priciest total game release of the year. Skylanders Superchargers kept launch releases relatively short and sweet, and Disney Infinity 3.0 is definitely playing the long Star Wars game. But not LEGO Dimensions. Along with the priciest starter kit (not counting Superchargers special Dark Editions), Warner Bros. is releasing a trio of Level Packs, two Team Packs and a whopping 15 different Fun Packs. What does that all mean? Now that we know the basics, what do you need to play? A single $99 starter kit for PlayStation 4, Xbox One or Wii U goes quite a long way. The kit includes the game itself; the game’s portal platform, which connects to your video game console via USB, as well as the bricks needed to construct it; three minifigures—Batman, Gandalf and Wildstyle; and a miniature Batmobile that can be rebuilt into three different configurations, as with all of the game’s accessories. With the starter kit you can experience the game’s complete single player (or local co-op) story mode from start to finish. There will be collectibles you cannot unlock due to them requiring a power the three included figures do not have, but the basic game is all there. 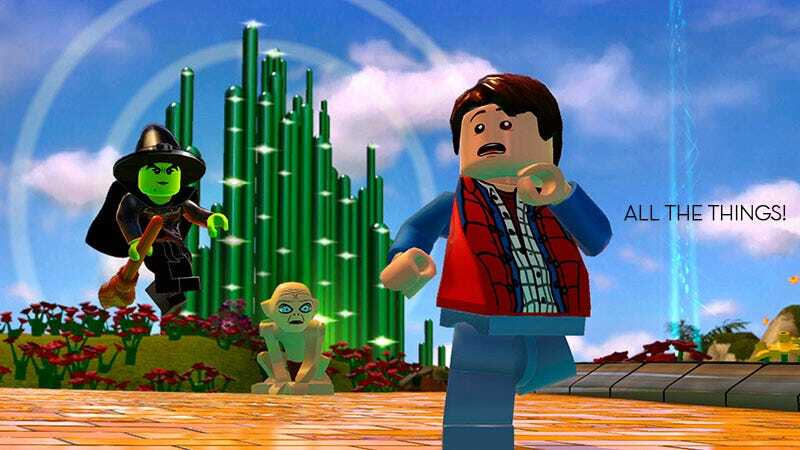 The three minifigures will also grant access to three of LEGO Dimensions’ free-roaming Adventure Worlds, basically expansive themed playgrounds filled with challenges and secrets and fun. The DC Comics, Lord of the Rings and LEGO Movie Adventure Worlds are accessible with just the starter kit. You don’t need to purchase every single toy in order to experience all of the in-game content available for LEGO Dimensions at launch. Just a little over half. Starter Kit: Can’t escape this one. Unlocks LEGO Movie, Lord of the Rings and DC Comics Adventure Worlds. Portal Level Pack: The only Portal product in the line. Unlocks the special Portal level and the Aperture Science Adventure World. Back to the Future Level Pack: Unlocks the Back to the Future level and corresponding Adventure World. If you just want the Adventure World you’ll have to wait for Doc Brown’s Fun Pack release later on. The Simpson’s Level Pack: Unlocks The Simpsons level and Springfield Adventure World. Homer’s the only Simpsons character available at launch. Scooby Doo Team Pack: Unlocks the Scooby Doo Adventure World. No more Scooby Doo for you after this. Jurassic World Team Pack: The only Jurassic World release unlocks the Jurassic World Adventure World, which is as fun as it is redundant. The Wicked Witch of the West Fun Pack: Unlocks The Wizard of Oz Adventure World. The only set in this series. One LEGO Chima Fun Pack: Laval, Cragger and Eris each unlock the Chima Adventure World. Each is available at launch, though Laval is a Toys’R’Us exclusive. One LEGO Ninjago Fun Pack: Zane, Nya and Jay are each available at launch, and each unlock the Ninjago Adventure World. Jay is a Toys’R’Us exclusive. The grand total for this complete content unlock is $285. Still a lot, but it’s no $465. What’s missing from the unlocking all the content list? If you go that route then only 12 Fun Packs stand between you and complete mastery of your LEGO domain. I know this, because that’s exactly how many kits are in my Amazon order. With five waves of sets scheduled between tomorrow and May of next year, not all content from LEGO Dimensions will be available at launch. The Doctor Who Level Pack arrives on November 3. Until then, no Doctor Who Adventure World for you. Same for Ghostbusters, the Level Pack of which is due out January 16. And finally the Midway Arcade Level Pack isn’t arriving until March 15. If the inspired Midway Arcade level from the main game is any indication, untold riches await in the Adventure World. I’ve fielded many questions since running the game review earlier today about what sort of extended gameplay comes with each Level Kit. Between the three launch Level Kits—Back to the Future, Portal and The Simpsons—I averaged about a half hour of gameplay in the included levels. Mind you that’s without attempting to unlock secrets or gathering collectibles or hitting that bits goal. I’d say a dedicated player could squeeze an hour or so out of each. Generally there’s more to do in the figure-unlocked Adventure Worlds than in the Level Pack levels. Unfortunately for Portal, there is no corresponding Fun Pack, so the Level Pack is it. Here’s a brief rundown of the three. Portal: Chell returns to the Aperture Science testing facility to go another round with GLaDOS, aided by the mildly villainous in an adorable sort of way Wheatley. The level is a series of testing chambers, culminating in a good-old Chell Vs. GLaDOS showdown. Easily my favorite of the three. Back To The Future: the level here follows the story of the movie in the most skipping stone of ways. We follow Marty from Doc Brown’s garage to the mall parking lot. From there we go to the past, where we’re immediately tasked with hooking up wires to the clock tower to power the DeLorean’s trip back. We make it back, and that’s it. The whole thing played out in under 20 minutes, so maybe that hour was a generous estimate for this set. Disappointing content, but great music. The Simpsons: Homer has to make it from home to a chili cooking contest, where he eats hallucinogenic peppers and goes on a vision quest. It’s trippy in a very Simpsons sort of way. I think I had more fun playing with Homer’s powers (belching and hulking out) and driving about the family’s pink car than playing through the story, but fun was definitely had. If you’re planning on getting a bunch or all of the sets, make sure you have a container for the extra bits. There are always extra bits. I used a tiny wooden chest got from the dollar store for my birthday one year. Repeat after that large, bolded bit right above this sentence. The LEGO Dimensions starter kit is packed with fun things to do, and I don’t foresee a shortage of sets in the long run. Start with that, and then collect other bits that interest you as you go along. Treat yourself or your loved ones with a new character here, a Level Pack there. Prolong that magic. Hopefully this has been a helpful guide, and you’ve got a better idea of what enjoying all LEGO Dimensions has to offer means to you and your wallet. Happy building!